Last week I presented the first two answers to questions I sent along last year to Xavier to learn more about how they decided to position a "Search" box and the dominant feature of the university's home page. Here today are the next two answers from Rob Riesland, Director for Web Services in the Marketing and Communications Office. If you missed the first two questions and answers, you can start with those first if you wish. What did you do to ensure that your "search" function worked well enough to make this change? Nailing the search was the key to making this work. We decided to enhance our current Google CSE (free version) by implementing our own, manually-maintained autocomplete script on top of the Google search. This gives us the fine-grained control that we desire. To start off with, we automatically added every academic program to the search suggestions. The analytics tell us that this is one major area that prospective students are looking for. We also added all of the university offices, in their own category, with a lower priority than the academic programs. We also added general search terms. We have been tracking search for years and know what people are looking for during different times of the year. We set minimum annual and monthly thresholds for search counts and used that data to add important search terms to the suggestions. This data is reviewed on a regular basis, with slightly lowered thresholds each time, and new items are added as needed. Lastly, we told everyone on campus what we were doing, asked them to search for items that are important to their department, and let us know if there is anything we need to do differently. We did not receive much feedback from this round, but I think it was an important part of the process. Over the past few months we have added several items to the search as needed. This is an important ability that allows us to adjust as needed and as requested by the departments on campus. How will you measure success going forward? Who is responsible for monitoring results? Are people using the results? We have extensive analytics on the search box and we track if people are using the search suggestions or if they default to the standard search. It should be noted that we also display up to 4 suggestions on the traditional results page, in case people make it that far. We are also looking at user behavior over time, tracking how many site visitors, especially external, use the search vs the traditional navigation techniques. The new information architecture of the whole site requires regular review and looking at the search box will certainly be part of that. This process will be run by the Office of Marketing and Communications, in collaboration with other departments on campus. There is of course, great marketing opportunity here. I'll be looking forward to learning more about what "new" or first-time visitors search for most often. That's a key indicator of the top tasks that website visitors want to complete. And creating a website that let's people complete their top tasks as quickly and easily as possible is more important to marketing success than anything else on the site. Especially important: Are visitors searching for content that is not already on the website? And if it is present, what happens when visitors land on the page with that content? This is also a fine opportunity to learn more about the language people, especially future students, use. Those are the "carewords" that will engage people throughout a website. Join 7,125+ people and follow me on Twitter. Higher education marketers often discuss how a college or university can differentiate itself in a crowded marketplace. That differentiation almost never takes place on the first contact many potential students have with a school: the home page. Last year when searching about for a Link of the Week selection I decided to visit Jesuit university home pages in alpha order to see if I could find anything special among them. After visiting more than 20, I opened the Xavier University home page... and was amazed. Imposed over an image of a campus photo was the largest search box I had ever seen on a higher education website. 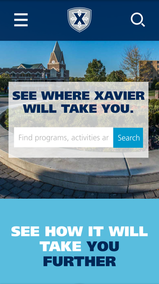 Visitors were urged to "See where Xavier will take you" and to "Find programs, activities, and more...." No attempt to guide people to where the university felt they should go first. Just a clear path to complete the top task that brought them to the site. Genius. A home page that immediately set Xavier University apart from all others. It became the July 24 Link of the Week selection. And so I sent off four questions about the website to Doug Ruschman, AVP for Marketing and Communications. And Doug sent my questions to Rob Liesland, Director for Web Services in the Marketing and Communications Office, Rob, said Doug, had the original idea and guided much of the work to bring the idea to reality. Today you'll find answers to my first two questions. Next week I'll add the other two answers. If you ever despair that true innovation in higher education website design is not possible, reread the tale that Rob tells here. Giving such prominence to the "Search" feature on your home page is unusual in higher education. Why did you decide to do that? What do you expect to gain from it? When planning for the updated site we knew we were looking for something different. We looked at many sites within Higher Ed and saw a lot of the same designs that schools have been using for the past few years. We also looked at trends outside of Higher Ed and it was obvious that search was becoming a more prominent navigation tool (Google, Amazon, Facebook). We had already decided that our primary audience was going to be prospective students, but even with our audience narrowly defined there were still quite a few resources that we wanted them to have quick access to. The search box was a natural fit for this goal. It would allow us to give them instant access to the part of the site they are interested in, without all of the clutter and clicks. To be clear, we also knew that many users were familiar with industry standards and included the necessary navigation items in the header and content in the body of the page. The search box also had the added benefit of allowing us to include other audiences' destinations without negatively impacting the prospective student experience, so items that had previously been on the homepage could also be included as suggestions. Who was involved in the decision to make "search" so prominent? How long did it take and what questions were raised about the change? The decision to make search so prominent was decided upon within our planning committee, which consisted of members of the Office of Marketing and Communications. We probably spent 2-3 months planning and discussing this particular feature as the new information architecture for the site was coming together. Certainly the whole time was not spent on this item, but it was included in the big-picture planning. Once this direction was chosen we had multiple meetings with key figures on campus to discuss the idea. During these meetings we would often discuss the transition that Amazon has gone through over the years, from a department-based website where one would click to narrow the results, to a search-based website, where one would search specifically for their destination. I think this really resonated with folks. There were no questions raised about the change and there has been no internal or external backlash, that we have seen. This has been a sign to us that we have gone in the right direction and that people are ready for the change. Join 7,130+ people and follow me on Twitter. February greetings to long-time and new readers. The 2106 eduWeb Digital Summit Call for Papers is extended until February 7. Review the 5 track choices and send a presentation proposal this week. Start at bit.ly/1Or24vf and plan to join us in Denver in August. Join 7,110+ followers on Twitter at twitter.com/HighEdMarketing for my daily marketing updates. And now here are your February marketing news and notes. Does the reality of your brand create special challenges for the agency you hired to promote it with an "original, interesting, memorable" campaign? The Federal Trade Commission has filed suit against DeVry University for deceptive advertising. One specific concern is with claims about employment after graduation, including jobs in graduates' fields of study. My friends in advertising have often asked me how colleges and universities can make the claims they do in recruitment materials. The DeVry suit suggests that every school should review ads, publications, and websites to eliminate marketing claims that cannot be substantiated. Mobile advertising continues to grow in higher education and elsewhere. But what format is most in favor in the advertising world? Native advertising is projected to decline from a 2015 high point while still remaining the most preferred format by 42 percent of advertisers. Interest in both rich media and banner ads also is declining. Interest is growing in interstitial ads that take up the entire mobile screen. Will that boost even higher the growing use of ad-blockers? Ken Bowen at Marketing Experiments has summarized major research from 2015 in "The Surprising Sensitivity of a Single Line of Text," with special attention to headings on email and landing pages that increase visitor conversions. When you visit you will notice a more generous version of my 5-second rule. Ken says you have 7 seconds to connect as your page opens. My favorite finding: Section lists 3 principles for effective headlines, including an admonition to make sure that a headline matches the current motivation of the person who receives it. In other words, is it really best in the first response to an inquiry from a high school student to invite that person to visit campus? If enrolling international students is important to you, be sure to compare your website content with the 5 steps outlined by Megan Brenn-White in "5 Ways International Students View Your Website Differently." Pay special attention to creating content that speaks to the three top concerns of international students and their parents: funding, campus safety, and safety in the areas around your campus. Is this perhaps one list too far? The U.K. publication has reviewed the number of international students and staff and the number of journal articles authored with someone from outside the host country to create a this list of the 200 most international universities. Creating a system-wide brand with national recognition has long been a goal of State University of New York chancellors. At the same time, New York's four major research universities (Albany, Binghamton, Buffalo, and Stony Brook) have not been especially eager to adopt the "SUNY" affiliation. No illusions exist in my head that John Allsopp will succeed in convincing people to dramatically reduce the weight of websites collapsing under ads, tracking codes, new video and photo features and much more. Not enough people care that "heavy pages tend to be slow pages, and slow pages mean unhappy users." But maybe, just maybe, if you get people you know to read "The Website Obesity Crisis" you might encourage at least some level of restraint that is missing on many if not most websites today, including higher education sites. Is your site obese? Do you really think responsive design solves your mobile challenges? What is the Alpha Generation? They are the folks between just born minutes ago and two years of age. The Mobile Revolution: Net Yet Complete for High School Students? Last week I completed a CCI survey of potential future freshman students in the inquiry pool of a Midwestern university. We asked a question about the device types used most often to access the university website. Desktop or laptop computers were used most often by 62 percent. Smartphones were used most often by 30 percent. Just 8 percent said they preferred tablets. A qualitative question asked people to list the most important tasks they visited the site to complete. Most often mentioned were academic program content and cost and affordability.